Still, this was a big hit and I had to hide the last serving to smuggle home for its beauty shot. Pick up a panettone at Trader Joe’s next year. Their brands are consistently moist and tasty. Shop early because TJ’s sell out by mid-December. TIP: I make this a day ahead, usually because I am on a tight kitchen schedule during the holidays. As it turns out, the flavors seem only to improve after a day of “rest”. A lighter version of a holiday bread pudding. Butter a 9X11 baking dish and set aside. Cut off and discard the dark brown crust on the panettone. Cut or tear panettone into 1-inch pieces. Place on a baking dish in a single layer. Toast in oven for 10 minutes, just until lightly browned. Keeping the oven at 350, place the toasted panettone pieces in the buttered baking dish. 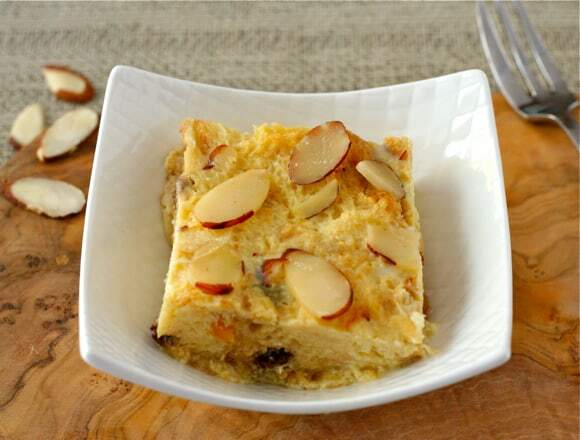 In a large bowl, mix together the eggs, milk, sugar, vanilla and almond extract. Pour custard over the panettone pieces. Sprinkle almonds on top. Place the baking dish in a larger dish, such as a roasting pan. Fill the larger pan with enough hot tap water so that the baking dish sits in about an inch of water. Cover the roasting pan with foil and cut a few vents in it. Bake, covered for 45 minutes. Uncover and bake an additional 45 minutes, until pudding is golden brown on top and a knife inserted cleans out clean. Serve warm or at room temperature. Can be made a day ahead and stored, covered, in fridge. This sounds so wonderful, Liz. Comfort food meets festive food on the plate. Perfect for the holidays. Hope you are having a wonderful New Year, my dear friend. Happy New Year to you, Susan – I was so ready for the holidays to come to a close. This sounds just perfect for me! I love panettone (for breakfast at Christmas time) and I love bread pudding! Wish I could have some now! I wish you could, too, Jayne, but I only find it at Christmas – maybe an Italian grocery/deli might have it out of season. Jorge and I make Ina’s bread pudding each year. So tasty! We’ll have to give this one a try in December :)! I don’t think you will miss the 8 egg yolks and all that cream. Zounds does that sound good! I wonder…have you ever just popped it in the oven without the water bath? Hmmm….thinking that might work, and would save fuss. Might have to try it myself! It would be great to do without the hassle of the water bath – I have never tried it. It felt a little awkward but I HAD to get home to my camera. Some guest! That water bath is what takes it over the top, it is an important step. I love the look of this recipe Liz, I usually substitute Laictaid or Almond Milk or something to tone the calories down too. I have not had Panetone since I went gluten free, this is something I will have to make with those “other” flours from scratch. Beautiful photo and thanks for posting up! I love bread pudding and this looks marvelous! I am a huge fan of panettone, I wonder if I can still find some at the market….if so, I am SO making this over the weekend!